The Handbook of Asian Security Studies provides a detailed exploration of security dynamics in the three distinct subregions that comprise Asia, and also bridges the study of these regions by exploring the geopolitical links between each of them. This Handbook is divided geographically into four main parts: Part I: Northeast Asia Part II: South Asia Part III: Southeast Asia Part IV: Cross Regional Issues Despite the richness and complexity of security issues in Asia, and the theoretical and conceptual debates these have spawned, there is no single volume that scholars can turn to for succinct, cogent and dispassionate analysis of these issues. 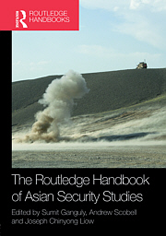 The Handbook of Asian Security Studies fills this important gap in the literature, dealing with all major security issues in the area which range from unresolved territorial disputes (maritime and inland), irredentist claims and intra-state conflicts to transnational terrorist movements and nuclear rivalries. This volume contains essays by many leading scholars in the field and will be essential reading for all students of Asian security, Asian politics, and International Relations in general.